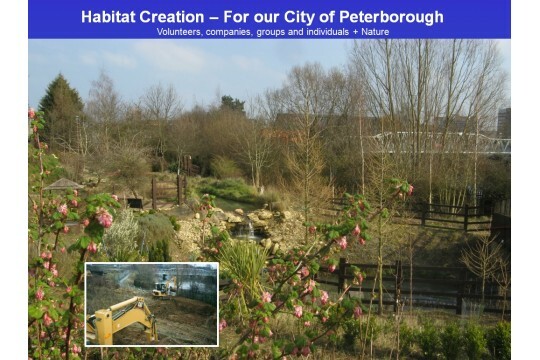 Our Wildlife/Nature Haven is primarily a habitat creation programme. However, its deeper purpose is to emphasise the important links between 'Our Man-Made World' and 'Our Natural World'. We cannot flourish without the benefits of a healthy, properly functioning natural environment; it is the foundation for our very own well-being. Our Environmental Education Centre, when complete will be used to 'Entertain and Educate' with hands-on activities concerning environmental subjects. The project is dedicated to ensuring our children are entertained, educated and excited about preserving and improving our environment for the future and ensuring that it's sustainable for their children. We are a mixed group with one thing in common, our concern for the environment. This is one big team effort. It is truly wonderful to see what can be achieved when Mums, dads, children, schools, groups, colleges and businesses all work together for a common cause - our dream - to entertain and educate our children and adults about our own environment. Initially volunteers built just a wildlife haven, but then we moved on to build an education centre with a 2.5M solar powered world. Will provide the materials for a youngster to build a birdbox.